And some help from “Twin Peaks” director David Lynch. For the past four years, Rich has repeated this daily ritual to help heal her emotional scars from the 18 months she spent as an Army nurse in Iraq in 2006 and 2007. After being diagnosed with post-traumatic stress disorder, she bounced from one treatment to another without much effect. Then she was introduced to Transcendental Meditation, or TM, the mantra-based meditation practice best known for its association with the Beatles and its controversial—some say cultish—guru, Maharishi Mahesh Yogi. Rich says she’d always been “suspicious” of such things. But by the time she found TM, she was isolated, agitated, and desperate for a breakthrough. She suffered through recurrent dreams of being covered in blood, laid out on top of garbage bags stuffed with severed limbs. “We did an awful lot of amputations,” she explains. She says that TM, more than any kind of therapy or pharmaceutical, has kept these horrors at bay. The effort has been led by the David Lynch Foundation, aided by $30 million from the Pentagon and the National Institutes of Health. She’s one of thousands of veterans who have turned to TM to treat their PTSD—with blessing of the Pentagon and the Veterans Administration, which are struggling to treat the epidemic levels of PTSD and suicide among Iraq and Afghanistan vets. (Twenty percent of recent combat vets have PTSD or depression, and approximately 20 veterans commit suicide every day.) The effort has been spearheaded by the David Lynch Foundation, a nonprofit founded by the Blue Velvet and Twin Peaks director to promote TM worldwide. Aided by $30 million in grants from the Pentagon and the National Institutes of Health, Lynch’s foundation has worked with VA centers, Army and Marine bases, and veterans’ organizations to bring TM to vets and active-duty soldiers. Today the practice is undergoing a revival, thanks in no small part to Lynch, who paid a cool $1 million to attend Maharishi’s month-long, teleconferenced “Millionaire’s Enlightenment Course” in 2003. (A lifetime TM membership for non-millionaires costs between $960 and $1,500). His eponymous foundation promotes TM to prisoners, homeless people, and victims of abuse. And celebrities: TM’s most outspoken devotees include Oprah, Ellen DeGeneres, Jennifer Aniston, and even Howard Stern. Jerry Seinfeld has likened it to a phone charger “for your mind and body.” TM has also seeped into corporate America, with CEOs, techies, and hedge fund managers crediting their success to the practice. 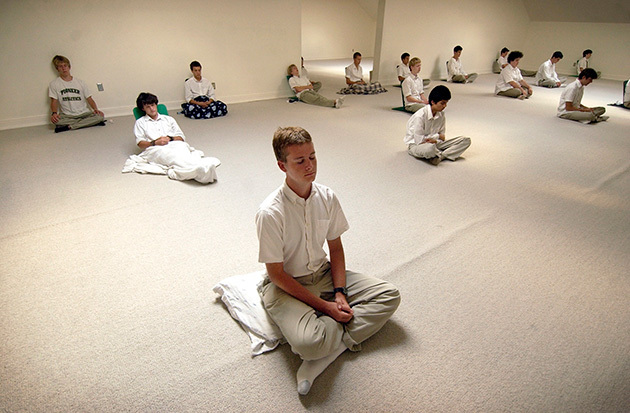 Students at the Maharishi School of the Age of Enlightenment in Fairfield, Iowa, in 2004. Talk of yogic flying has been replaced by claims that TM can make you happier and healthier. Peer-reviewed studies—some funded or conducted by the Maharishi University of Management—have documented its positive effects on the mind and body, showing that it eases stress, reduces blood pressure, decreases insomnia, and improves memory and other brain functions. It’s been shown to relieve asthma and hypertension. A 2006 study from Cedars-Sinai Medical Center found that it reduces obesity and the incidence of diabetes in people with coronary heart disease. TM practitioners receive a secret mantra—a meaningless word-sound—and repeat it to trigger a free-flowing 20-minute meditation twice a day. The mantra’s lack of meaning is supposed to let the mind ease into an essentially silent state of “transcendental” consciousness. In 2012, the Department of Defense put up $2.4 million for an ongoing study comparing TM with prolonged-exposure therapy, one of the VA’s preferred treatments for PTSD. Unlike TM, which emphasizes moving beyond distracting or disturbing thoughts, prolonged exposure therapy involves going over traumatic events over and over until patients become desensitized to them. It’s not very popular, says Rees. “There’s more veterans than you can count who say, ‘That’s the worst day of my life. And you want me to relive that every time I come in here?’” In January 2016, 74 active-duty service members with traumatic brain injury and post-traumatic stress participated in a study on TM at the Medical College of Georgia at Augusta University. Half learned TM; the other half did not. After a month, only 11 percent of those who practiced TM had increased their medication levels, compared with more than 40 percent of those who weren’t meditating.